Teacher Carol Ingram uses the interactive whiteboard in her Preschool class to teach reading for her 3 till 5 year old students. Read Carol’s story and get inspired by her experiences! Each morning I start with the introduction round where we play ‘I am here’. My preschoolers (3-4 year olds) trace block letters of their name, or progressively write each letter of their name. For the 4-5 year olds I type up their name on the smart board with leaving a blank. Starting at the first letter and, each week moving the blank towards the last letter. In a few weeks they are able to write their full name all by themselves. 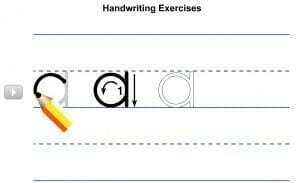 The hand writing tool is very useful for this activity. We then use games on Gynzy to make our lessons fun! I have about ten games saved in the ‘Favorites’ section which makes it so easy to find the ones I love. I love using the ‘Initial Consonant Sound game’ to help enforce our learning of letter sounds. The kids love it because they feel like big kids using the smart board. With my older class, I practice the whole alphabet. To improve their skills I use the activity ‘Create Words’ almost every day. I set the game to a three letter word that the kids can sound out. I started off picking a word like ‘cat’, and having them sound out the letters with me, but now, at the end of school, I ask for volunteers to come up and spell their own words all by themselves, while the rest of us try and guess what they are spelling. After we have spelled about five words, I ask individuals to read the words we have spelled. The words are really easy accessible, because the game automatically saves all words created on the top left corner. This is a great opportunity for them to not only recall the information, but to sound out the words again. And when they are able to remember what ‘cat’ looks like and tell me quickly, I praise them on their reading skills. For the younger classes I use the ‘Short or Long Vowel Words game’. This is a simplified version that only asks for the middle vowel sound of a three letter word. It also comes with a picture for the kids to look at. We name the object, and then sound out the letters. I ask them what letter is missing; tell them to look at their friend’s mouth to see what it’s doing when they say the letter. I teach them that our mouths give us a clue to what the letter is. I started using the ‘Spring Words games’ closer to the end of school. There are four games in one. 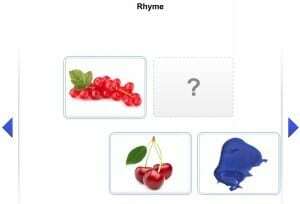 First Letter, Rhyme with Vowels, Word and Image and Number of Syllables. I especially like the Word and Image game where the kids see a picture and try to guess which word (three options) names the object. This game is a great tool to help them understand the importance of knowing their alphabet letter sounds, and how knowing those sounds helps us learn to read. We focus on the first sound we hear when we name the object, and if there are two words with the same initial letter, we then try to listen for other sounds we recognize to determine which one we need. I make them laugh after we discover the right word by looking at the other words and saying, “Well it can’t be this one, it starts with a ‘m’. We don’t want a ‘mooster’, we want a ‘rooster’.” I am always telling them how smart they are, that they are reading like big kids. Other games I use are Alphabet, Rhyme with Images and Memory, which is just plain good exercise for their brains. They have learned how to click an object, and how to drag something with their knuckle rather than their finger, which has a smoother motion, because of these games. I am so grateful for this website, and plan to subscribe to it next year so it will become a permanent tool in my curriculum.